We treat our customers like family by giving them THE BEST certified inspectors, company-trained work crews, a responsive customer service department, and competitive pricing without sacrificing high-quality work. Pound for pound, we are THE BEST value in the waterproofing industry. How thorough is your free inspection? We perform the most thorough basement inspection in the business which includes a full explanation of the exact type of foundation you have and how it was built. Each type of foundation requires an entirely different waterproofing approach. Our inspectors will show you our fully customized and comprehensive SuperDry System solution to solve your basement water problem. What can I expect from a SuperDry System installation? Give you a super dry basement. Eliminate any further damage from water infiltration. Guarantee no future wall or floor cracks. Achieve a level of dryness necessary to confidently finish your basement. Resolve any, and all mold issues. Save money on our maintenance-free system. No more service visits. Give you the most effective basement waterproofing system money can buy while fitting perfectly into your budget. What is included in the American Dry Guarantee? 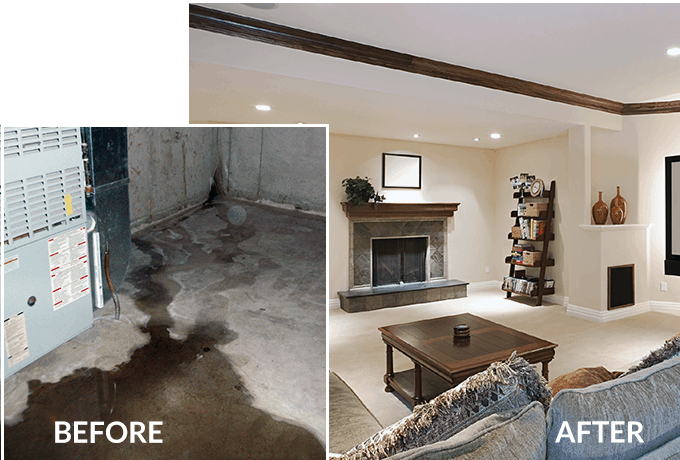 American Dry guarantees twice the results at twice the value for your dollar and a money-back guarantee that nobody in the basement waterproofing industry can promise. Nobody warranties walls or floors from cracking! We do. The SuperDry system is so effective we can guarantee that you will never get cracks in your floor or walls or we will fix them all for free. Our warranty covers our drainage system too from clogging and requiring maintenance. What kind of maintenance cost should I expect? None. Our repair work to walls, floor and drainage pipe installation are fully guaranteed for a lifetime. We guarantee you will never under any circumstance spend one penny on maintenance for your waterproofing system installed by American Dry Basement Systems. Is your sump pump guaranteed forever? Our primary 3/4 hp sump pumps have a 5 year warranty and our backup pump/battery combo have a 3 year warranty. Sump Pump maintenance is a requirement regardless of any system you choose to install. An owner can do visual inspection on an annual basis and do any maintenance, if required, without cost. We offer service contracts but will gladly show you how to keep your sump pump up to spec, so you can save money.